Extracted from seaweeds Gelidium, perfect for microbiological culturing and Drosophila food usage. Extracted from seaweeds Gelidium. Superb quality. Excellent for microbiololgical and worm culturing. Infusion of beef. Prepared from lean bovine skeletal muscle. Highly nutritious. 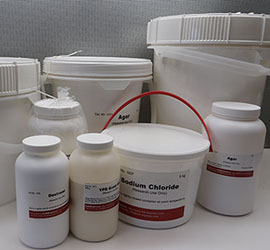 Used in microbiological culturing. High quality hydrolysae produced by enzymatic digestion of animal tissues. Pancreatic digest of casein containing all the amino acids found in casein as well as large peptide fractions. Excellent nutrient for use in culture media. Water soluable extract of selected autolyzed yeast cells. Excellent growth source in cluture media. 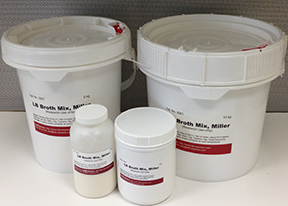 Micro-granulated form produces far less dust than regular yeast extract. Excellent nutrient for use in culture media. Formula: Per liter: NaCl 10g, Tryptone 10g, Yeast Extract 5g. Formula: Per liter: NaCl 10g, Tryptone 10g, Yeast Extract 5g, Agar 15g. Usage: Dissolve 40g of mix in 1 liter of water, autoclave to sterilize. Formula: Per liter: NaCl 5g, Tryptone 10g, Yeast Extract 5g. Formula: Per liter: NaCl 5g, Tryptone 10g, Yeast Extract 5g, Agar 15g. Usage: Dissolve 35g of mix in 1 liter of water, autoclave to sterilize. Formula: per liter: NaCl 2g, Tryptone 4g, [PO4]25mM, Agar 20g. Usage: dissolve 29.5g mix in 1 liter of water. After autoclaving, add 1ml of 5mg/ml Cholesterol to the medium. Formula: per liter: NaCl 3g, Peptone 2.5g, Agar 17g. Usage: dissolve 22.5g mix in 1 liter of water. After autoclaving, add [Mg++], [Ca++], [PO4] and Cholesterol. Formula: Per liter: Beef Extract 3g, Peptone 5g. Usage: Dissolve 8g of mix in 1 liter of water, autoclave to sterilize. Formula: Per liter: Beef Extract 3g, Peptone 5g, Agar 15g. Usage: Dissolve 23g of mix in 1 liter of water, autoclave to sterilize. Usage: Dissolve 47.6g of mix and 4 ml of Glycerol in 1 liter of water, autoclave to sterilize. Storage: in tightly-closed container at room teperature. Formula: Per liter: NaCL 5g, Tryptone 16g, Yeast Extract 10g. Usage: Dissolve 31g of mix in 1 liter of water, adjust PH if desire, autoclave to sterilize. Formula: Per liter: NaCL 5g, Tryptone 16g, Yeast Extract 10g, Agar 15g. Usage: Dissolve 46g of mix in 1 liter of water, adjust PH if desire, autoclave to sterilize. Formula: Per liter: Peptone 20g, Yeast Extract 10g, Glucose 20g. Usage: Dissolve 50g of mix in 1 liter of water, adjust PH to 6.8, autoclave at 121oC for 15 min. Formula: Per liter: Peptone 20g, Yeast Extract 10g, Glucose 20g, Agar 20g. Usage: Dissolve 70g of mix in 1 liter of water, adjust PH to 6.8, autoclave at 121oC for 15 min.